Chief among them are damaging sheep-ranching practices and human-induced fires, which have replaced the original beech forests with degraded pastures and eroded soils. Suzanne Wylie, executive director of Reforestemos Patagonia, participated in the interview below to describe her organization’s marketing innovations and expansion ambitions. CFN: What was the origin of Reforestemos Patagonia as a campaign? What was the primary motivation? Who were the leaders? Wylie: It all started with a big wildfire in Torres del Paine National Park on December 2011. It was catastrophic. 400 square kilometers hectares were burnt. It took a whole summer to combat the fire. There was a small group of young individuals who had experience in reforestation initiatives. They started a citizen campaign calling for people to buy a tree to be planted in the Patagonia region. The big innovation was to create an engaging and playful digital platform where one could donate a tree for three dollars. The “magic” was that donors could see on Google Earth where each individual tree would be planted. In other words, a simple monetary donation could be visibly translated into a product that you can see planted on public lands. This generated a lot of attention. In the meantime, a five-year agreement was signed with the Chilean Forest Service (CONAF) to plant the trees. Reforestation areas were established and georeferenced inside national parks and reserves. CFN: The campaign targeted citizen support. You also worked with institutional donors. What were the companies looking for when they engaged with Reforestemos Patagonia? Wylie: The campaign started with key founders like Fallabella, Lan, Coca-Cola, Rockford and Cuprum, many of which still support us. The companies were clearly looking for marketing benefits. When they engage in this campaign, they give their consumers a code or gift card that customers can search for on our website. Companies want their consumers to have significant experiences with their brands. They want longer relationships with customers. CFN: What other benefits are companies perceiving when they donate trees? Are there any tax reductions or other compensations? Wylie: Most of the time, when companies donate money, they want to be subject to tax benefits. Unfortunately, environmental causes are not included in the Chilean laws that regulate donations. We are an expense for companies. This is a great barrier for the campaign to increase revenues. For many years, a law bill that regulates donations has been under discussion in Chile’s parliament. If it gets approved, it will significantly advance environmental donations, since they would be formally recognized. The challenge is that companies usually have a one-shot behavior: “I bought 20,000 trees from you; now, we are done.” It is really hard to convince companies to have a long-term relationship with the campaign. We have had good results with Rockford and beverage companies that are based in Patagonia because we are part of their brand´s DNA, but other companies just come and go. CFN: Have you experimented with other income-generation strategies such as mitigation banks and carbon markets? We are exploring the carbon credits market and would like to have a more active participation. The challenge is that there are carbon credits that would be cheaper than ours because our plantation costs in Patagonia are high. CFN: Besides working in national parks and reserves, have you worked with private land owners? Wylie: Now, if you ask me to sell the idea of donating money to plant trees on private lands, I’d say no one would give us money. One of the things people and companies like the most is that we tell them we are working on protected areas that belong to all Chileans. CONAF is our strategic partner organization. Because of this partnership, we are allowed to do reforestation campaigns in four Patagonian national parks and reserves. Our forest operations manager visits the parks with CONAF experts and they define the areas to be reforested. Our role is to provide the funding and volunteers. We also communicate through our media partners. This is a great example of a strong collaboration across public and private organizations. CFN: Are you interested in scaling up the impact of the campaign? I’m asking you this because you also have other educational and public outreach objectives that may be even more important to you. Wylie: Indeed, one of our objectives relates to education. That’s why we work with volunteers. We have two types of plantation strategies. On one hand, we conduct massive plantation operations with local and highly experienced workers. They can plant 30,000 trees in 15 days! On the other hand, we do plantations with volunteers from across the country who come with us during four days or a week. We learned from other foundations that a volunteer that goes through this experience automatically becomes a spokesperson for our campaign. This also provides us with press cover to reach out to more people. We are always going to maintain our volunteer programs. In terms of scaling up the campaign, of course we would be really interested in having a capital injection from or be absorbed by, let’s say, a forest company. That would be the only possible way to scale our efforts. CFN: Could you expand on this idea? 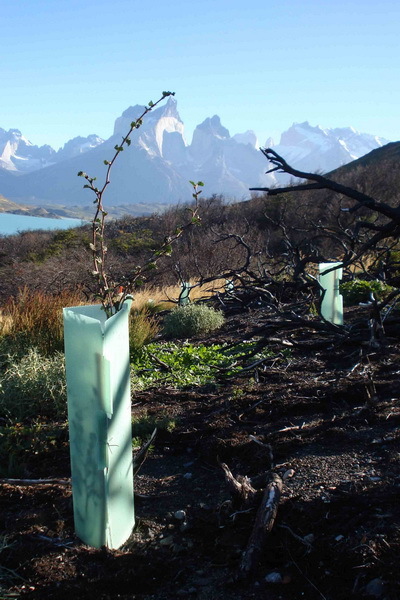 What are the strategies you have evaluated to scale up and really accomplish your goal of reforesting Patagonia? Wylie: Well, our team is very small and we have had to explore very creative ways to stay in business. Why? Because we are lacking a main sponsor. We need a big company that sponsors us with a monthly budget to cover our base costs, so we are capable of raising more money to grow our campaign and not just to maintain what we have. We have maintained our size in the last three years, but we are not growing. We have also started to promote permanent donor programs. Basically, people register with us and contribute with a fixed amount every month. There are a few organizations that have successfully implemented this kind of programs in Chile, such as the volunteer fire fighters. Now, this requires a sales force that can reach a wide audience to attract a critical mass of permanent donors. We see a big funding opportunity in this. CFN: Have you explored any funding opportunities through environmental impact mitigation or compensations led by the local forest industry? Wylie: Yes. There is a relatively strong local timber industry. They have to compensate with a certain area of restored native forests for every new acre of introduced conifer forests. But their standards are very high and Chilean regulations are not clear. For example, it is not clear whether nonprofit organizations like ours can participate in these compensations or not. New regulations are being developed, but this is where things are stuck for now. We definitely see an opportunity in forest compensations, but it will be significant only in the long term. Another opportunity we see is to collaborate with the government to accomplish the reforestation goals that were set on the COP21 agreement in Paris. Chile committed to reforest 100 square kilometers of native forests and to sustainably manage another equivalent area by 2030. This is a big challenge we would like to be part of solving. And we expect to see a strong governmental leadership to make it happen. CFN: What final thoughts would you like to share with our readers? Wylie: It is very important to understand what we are passionate about and what motivates us to do what we do. Patagonia is one of the most important green lungs that remains in the southern hemisphere. Over 70 percent of the Chilean protected areas are located in Patagonia. Our message is that Patagonia can be reforested and all of us can be involved. We just have to start the engines we need to get this job done. This is what we try to do as an organization. What we need the most is to find the right partners to leverage the resources we need and to diversify the contributions we receive. This is a shared responsibility between government, enterprises and citizens. We welcome new partners and contributors from all over the world.